Apple’s slow evolution of its Photos app—Camera Roll, iCloud library and all—has been a little confusing for users at times, but with iOS 10 and macOS Sierra now on the horizon, it’s finally settling down into a coherent, reliable service. There are still ways to get the most out of your app that you might not be aware of. Here are 10 features that could help you do more on mobile and desktop. Siri is being given more and more of a role in Apple’s operating systems. On iOS, and soon on macOS, you can ask Siri to “show me photos from July 2015" or “show me photos from New York” to dig into your library of pictures. Try dates, locations, times of the week, and so on, and remember: Siri now understands follow-up questions as well. In iOS 8 and OS X El Capitan, Apple added support for extensions in Photos, meaning third-party tools and filters can live inside native Apple apps for the first time. There aren’t a huge number of compatible apps around, but you’ll find some if you dig deep enough—try Fragment (iOS), Afterlight (iOS), Tonality (macOS), or Affinity Photo (macOS). Here’s one for iOS 10 users: with a photo open on your iDevice, tap the Edit button (the sliders) then choose the Markup option (a toolbox which might be hidden behind a three-dot menu). You’re then free to sketch away, add magnification bubbles, and drop in text layers. If you’ve signed up for the new iCloud Photo Library service then you can either keep your full resolution pictures in the cloud (to save space on your Mac) or download them to your hard drive (so they’re always instantly available, even offline). Make your choice via the iCloud tab on your desktop after selecting Photos and then Preferences. If you’ve made some adjustments you’re proud of to one picture, you can apply them to another. On the Edit screen in Photos in macOS (click the sliders icon to find it), choose Image then Copy Adjustments to copy the changes you’ve made. Open up another picture, head to the Edit screen again, and select Image followed by Paste Adjustments. A lot of services make use of the location data stored with images when you snap them on your phone. If you need to add this in later (for pictures taken with a DSLR perhaps) in the desktop app open up an image, click the Information (i) button on the toolbar, then select Assign a Location and type out a place or some latitude and longitude coordinates. There are probably some images you want to hide without deleting them (like screenshots), and you can do this with one or more pictures via the Share menu on iOS and the Image menu on macOS. Hidden pictures no longer show up in the Moments, Collections, or Years views, but they’re still available via a specially created Hidden folder on the Albums page. Another feature due in a couple of months on mobile and desktop is Memories. Select Memories (from the tab on iOS or the navigation pane on macOS) and, once you’ve given Photos permission, it will build up short slideshows automatically based around time, date, and location. It’s edited highlights of your life without any of the legwork. Photos are some of the most precious digital files we have and so accidentally deleting an image can be a panic-inducing mistake. 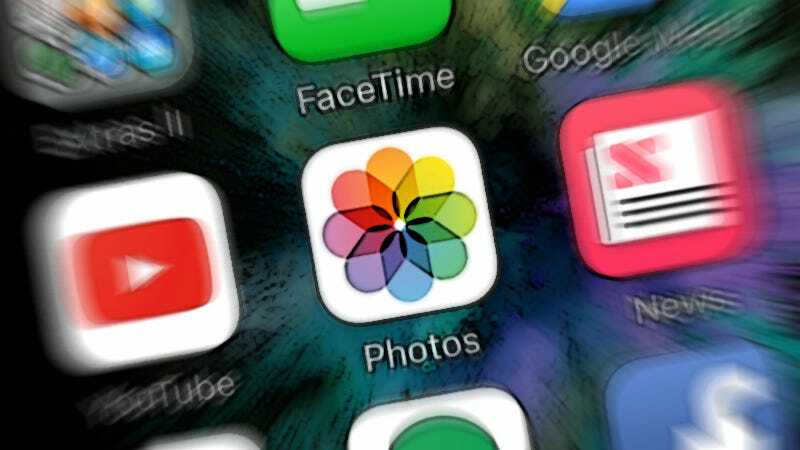 Don’t sweat: on iOS, macOS, and iCloud you can find a Recently Deleted folder where your erased pictures stay for up to a month. Jump in here to bring your pictures back or to get rid of them permanently. In love with Live Photos? They’re great for capturing moments in time, but getting them into formats you can use outside of Apple’s apps can be tricky. In Photos for macOS, hold down the Option key and drag one of your Live Photos to the desktop, where you’ll find it available in both JPEG and MOV formats for using in other applications or on the web.